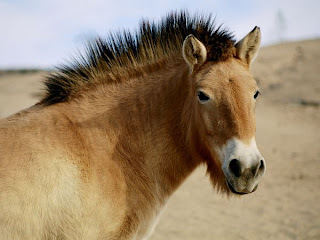 Animal Wildlife | Przewalski's Horse | The Przewalski's Horse is the only remaining wild horse still surviving in the world. Once, it became extinct because it was hunted or it lost in the feeding frenzy with farm animals. 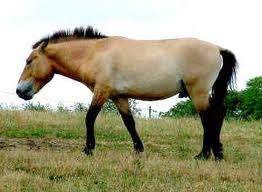 Przewalski's Horse is a rare and endangered subspecies of wild horse native to the steppes of central Asia, specifically China and Mongolia. At one time extinct in the wild, it has been reintroduced to its native habitat in Mongolia at the Khustain Nuruu National Park, Takhin Tal Nature Reserve and Khomiin Tal. 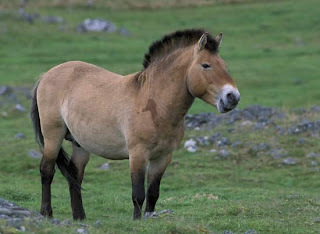 In the wild, Przewalski's Horses live in social groups consisting of a dominant stallion, a dominant lead mare, other mares, and their offspring. The patterns of their daily lives exhibit horse behavior similar to that of feral horse herds. Each group has a well-defined home range; within the range, the herd travels between three and six miles a day, spending time grazing, drinking, using salt licks and dozing. At night, the herd clusters and sleeps for about four hours. Ranges of different herds may overlap without conflict, as the stallions are more protective of their mares than their territory. With a short, muscular body, Przewalski’s horses are smaller than most domesticated horses. They have a pale belly and beige to reddish-brown coat that is short during summer and thicker and longer in winter. Their muzzle is white, and they don an erect and dark mane that lines their large head and neck. They stand about 12 to 14 hands tall at the shoulder, or about 48 to 56 inches (122 to 142 centimeters), and weigh about 440 to 750 pounds (200 to 340 kilograms). While extant in the wild, these horses ate grasses and other vegetation on the steppe, shrublands, and plains of western Mongolia and northern China. 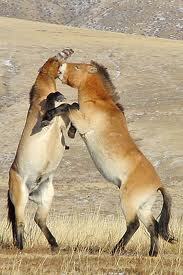 In the 1960s, Przewalski's Horses disappeared once. They were hunted for their meat and hide. Others lost in the feeding frenzy with farm horses. In the 1990s, a project started to return Przewalski's Horses to the wild. Zoos in Europe raised Przewalski's Horses and returned them to wildlife sanctuaries in hometown, Mongolia, and the number of Przewalski's Horses in the wild is starting to increase, little by little. 1 Response to "Przewalski's Horse"